The Sorbs (Upper Sorbian: Serbja, Lower Sorbian: Serby, in German: Sorben or also Wenden) are the smallest West-Slavic nation. They are recognised as national autochthonous minority in Germany. The area of settlement of the Sorbs – the region of Lusatia – stretches from Upper Lusatia in Saxony to Middle and Northern Lusatia in Brandenburg. For that reason, they are normally called the Lusatian Sorbs/Lausitzer Sorben/Łužiscy Serbja. Two different languages are distinguished: Upper Sorbian and Lower Sorbian. There are approximately 60,000 Sorbs in this region nowadays. The Sorbs can look back to a long turbulent history of 1500 years. In the course of the Migration Period in the fifth century, Slavic tribes came to Central Europe. They settled in the area that is now Eastern Germany. The borders of the old West-Slavic area (Limes Sorabicus) correspond roughly with the former German Democratic Republic. 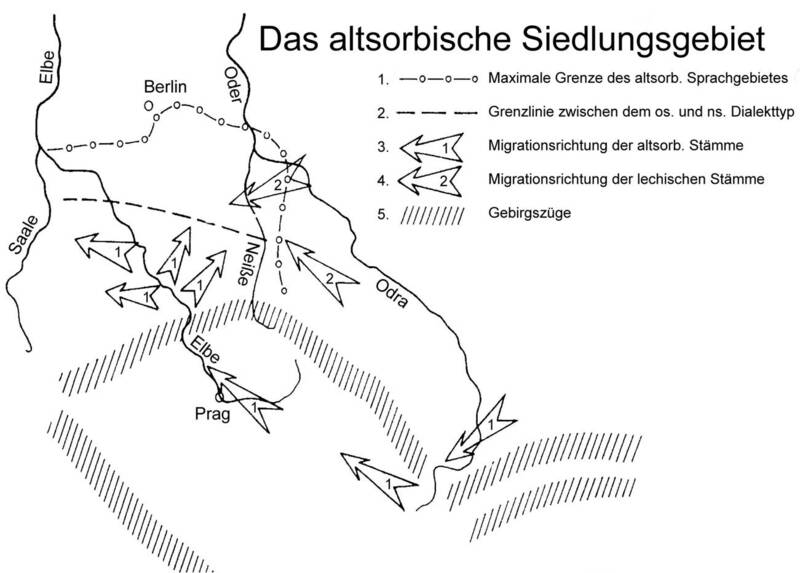 The area of settlement of the Sorbs stretched from Berlin in the North to the Saale in the West. After the Sorbs lost their political independence in the 10th century the area shrunk because of natural assimilation, a policy of intense Germanisation and by increasing industrialisation (lignite mining). Other reasons for the decline in the Sorbian-speaking population in the past two centuries have been the two World Wars and the prohibition to use the language – especially from 1933 until the end of the Second World War and the emigration of mainly young Sorbs from Lusatia. 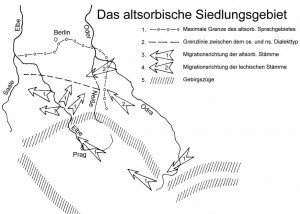 The Sorbs have been legally recognised as a national minority in the German Grundgesetz (Basic Law) and in the German Unification Treaty. Germany recognises the freedom of belief/identity. The Sorbs have the right to maintain and develop the Sorbian culture and the Sorbian traditions. They and their organisations have the right to foster and maintain the Sorbian language in public life. The officially recognised Sorbian area of settlement has been defined in the Statutes and Ordinances of the Lands of Saxony and Brandenburg. In Saxony the area has been defined permanently in the Statute on the Rights of the Sorbs in the Free State of Saxony (short: Sächsisches Sorbengesetz) from 1999; in Brandenburg rules have been laid down in 1994 in the Statute on the Exercise of the Rights of the Sorbs. On the level of the Lands the protection and the support for the Sorbs have been enshrined as a state objective in separate constitutional articles. Within the Sorbian area of settlement Sorbian is an official language besides German. There is not only Sorbian kindergardens and schools, but also e.g. bilingual city and street signs, media and various cultural institutions. An active club life, amateur theater and folklore, song and dance groups, Sorbian radio programs and monthly television programs ensure, that the culture and language are being preserved and passed on to the next generation. The two Sorbian languages are Indo-European languages from the family of the West-Slavic languages. There are two different standard languages: Upper Sorbian in the region of Upper Lusatia and Lower Sorbian in the region of Lower Lusatia. Both languages retained some special features from Old-Slavic. Whereas Upper Sorbian is closer to Czech and Slovak and developed from the dialect spoken in the surroundings of Bautzen, Lower Sorbian is more similar to Polish and has its roots in the dialect of Cottbus. Both languages have themselves several dialects. 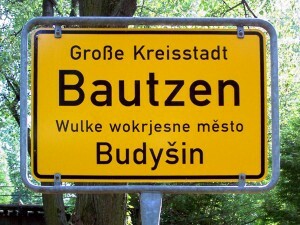 In the border region between Upper and Lower Lusatia transition dialects have developed. The first written documents in Sorbian came into being in relation with the reformation and the translation of the bible. Ethnologists estimate that the number of speakers of Lower Sorbian is 7,000 and the number of speakers of Upper Sorbian is 18,000; but trending down. The core of the Upper Sorbian area, where Sorbian is an everyday language, lies in the triangle between the towns of Bautzen, Hoyerswerda and Kamenz. In Lower Lusatia there is no longer a stable core area of this sort. Most Lower Sorbian mother tongue speakers are living in the municipalities between the Spreewald-area and Cottbus. Despite a close traditional connection of the Sorbian language with family, church and school one can notice a decline in everyday life. Next to economic reasons (unemployment, increased mobility, relocation of villages as a result of lignite mining), also the transmission of language within the family plays an important role. One reason for this is surely the image of the language – even today, many people do not recognize the benefits of bilingualism. The European campaign “language diversity” is facing this challenge; one of our focus regions is Lusatia/Łužica. The different situations in Upper and Lower Lusatia are the reason for a different way of language teaching. Sorbian is taught as a mother tongue, with the WITAJ-project or as second, foreign language. Besides, the different education systems of Saxony and Brandenburg play an important role. Different providers are managing child daycare centres, primary and secondary schools or offer adult education. Teaching of the Sorbian language in the individual child daycare centre differs according to the method used, the amount of time and the intensity. The immersion method is the most intensive form of language teaching. On the part of the educators, the entire daily routine is performed exclusively in the Sorbian language – either in all the groups of the daycare centre (full immersion) or only in some groups (partial immersion). As a general rule the principle of “one person – one language” applies, there is no language switch in contact with the children. Of course all the elements of the Brandenburg and Saxon curriculum are covered – but in he Sorbian language. In order to make the Sorbian language, without translation into German, comprehensible for the children, who predominantly come from German-speaking families, the educators deliberately use simple language, they often repeat – also using different words. What is said is enhanced by facial expressions and gestures. Especially because of the repetition in the rhythm of their daily life in kindergarten and the (largely) age-mixed WITAJ-groups, new children have a good chance to get along with a language that is foreign to them. The educator talks with all the children in two languages – Sorbian and German. In this model the child daycare centre or the educator decides on how long each language is being used. The comprehension of the Sorbian language is stimulated through the use of facial expression, gestures and pedagogical materials, partly by translation from Sorbian into German. Article 3 of the Statute on Child Daycare Centres of the Land of Brandenburg (Kindertagesstättengesetzes des Landes Brandenburg) (Kindertagesstättengesetz-KitaG of 27 June 2004). The most successful way of teaching the Sorbian language takes place in the schools that use the 2plus concept – a method applied in different types of bilingual Sorbian-German schools. According to the 2plus concept the school students are as a rule made literate in the mother tongue in primary school, and the parents decide which language that is. Literacy in the second language is raised simultaneously, so that the school students learn both alphabets essentially within the first year of school. Within the framework of language education in the subjects of Sorbian, German and also in other subjects mother tongue education will be provided in groups in Sorbian or in German. The precise distribution of lessons between Sorbian and German is the pedagogical responsibility of the school. For school students with Sorbian as their mother tongue the other subjects are given in the Sorbian language. For all the other students these subjects will be taught bilingually. The right to learn the Sorbian language and to be taught specifically defined subjects and grades in the Sorbian language, is guaranteed for students in the Sorbian area of settlement by both Saxony’s (Article 2 SächsSchulG) and Brandenburg’s School Statute (Article 5 BbgSchulG). Building on the acquisition of knowledge of the Sorbian language in child daycare centres, schools offer different forms of Sorbian language teaching. These have common objectives and principles in Saxony and Brandenburg, but are partially implemented in a different way. There are several authorities that can be regarded as supervisory bodies for Sorbian language education: Saxony’s Ministry for Education and Sports, Saxony’s Ministry for Science and the Arts, the WITAJ-Language Centre and the Sorbian School Association (Serbske šulske towarstwo). The monthly magazine for Sorbian teachers Serbska šula also function as an instrument for monitoring. Leipzig University has the only Sorabistik-Institut in Germany, where students are trained to become Sorbian teachers both for Saxony and for Brandenburg. Within the limits of its possibilities, the university takes into account the special requirements to training teachers for Sorbian schools and for schools with Sorbian teaching. Courses on the language and culture of the Sorbs are also offered at the University of Prague (Czech Republic) and Lviv (Ukraine). Public institutions of education of the Lands of Brandenburg and Saxony and also the WITAJ-Language Centre offer several trainings for educators and teachers.